Korea opens the world's fifth high-speed railway today, with the promise of improving the quality of life for more than 70 percent of the nation's population who live near the corridor between Seoul and Busan. "The high-speed train lays the ground for our prosperity," said acting President Goh Kun during an inaugural ceremony at Seoul Station March 30. "From the lives of ordinary Koreans to businesses, we will benefit from a range of improvements with this speed revolution." The electric-powered KTX (Korea Train Express) is being hailed as an environmentally friendly mode of transportation with a positive knock-on effect for reduced traffic congestion along the heavily used Gyeongbu Expressway. Officials said the bullet train could replace the operational equivalent of 33,000 cars and 8,000 buses per day between Seoul and Pusan, substantially reducing automobile pollution. The KTX is heavily based on the French TGV system and is made up of two power cars, one at each end, and 18 articulated passenger cabins. 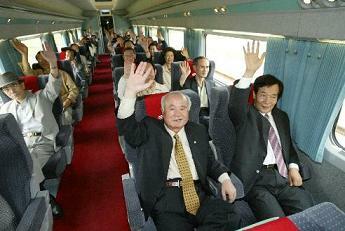 It tops out at 300 km/h and seats a maximum of 935 passengers. KTX trains travel along two routes. The Gyeongbu line has four stops from Seoul to Busan, while the Honam line branches west at Daejeon to Mokpo and makes five stops. The two lines are projected to initially serve more than 100,000 passengers daily, with substantial increases expected once the project is completed in 2010. The KTX Gyeongbu line will improve on the previously fastest train service by the Saemaeul fleet, from four hours and 10 minutes for the Seoul-Busan route to just two hours and 40 minutes. When the final section of the high-speed track is complete, this will be further reduced to one hour and 56 minutes, said Korean National Railroad officials. 1994 Korean TGV consortium awarded core system contract. A one-way Seoul to Busan KTX ticket will cost W45,000, around W15,000 cheaper that a domestic air ticket. The service is likely to take business away from the short-haul routes of domestic airlines. The Korea-France project was a massive bi-cultural undertaking. The project's process of technology transfer entailed sending 1,000 Korean engineers to France for training in detail drawing, process designing, key parts manufacturing and testing, and quality control. Over 1,000 French engineers then worked alongside their Korean counterparts on sites all along the route, overseeing plant planning, production facility establishment, welding, manufacturing, assembly and testing. On the operations side, nearly 600 Korail employees received training both in France and Korea in high speed rail operations, including driving, signaling, maintenance, safety management, passenger information systems and marketing. Korea stands to benefit from all this technological and management experience during the 15 years it worked with French bullet train manufacturer Alstom. The company has hinted at future joint projects in Asia, with Korea overseeing the management of construction projects and Alstom contributing the train hardware. The bullet train project was not always rosy, however. Since it was announced in 1989, a wide range of problems has plagued every step of the way. In 1993, partisan political grandstanding threatened to shut down the project before it had begun. Then there was the economic turmoil of the 1997 financial crisis that caused a severe cash-crunch necessitating contract and schedule revisions. Various route and design changes were also a major headache, as were emerging cases of slipshod construction. The completion date, which was originally set for 1998, was eventually postponed three times. When the Korean government first announced the project, three international train manufacturers --Germany's ICE bullet train built by Siemens, Mitsubishi with the Japanese Shinkhansen and France's Alstom TGV -- tendered bids. Initially, consultant engineers told the Korean government that the German and Japanese technology was superior, but the French high-speed train manufacturer Alstom was eventually selected. Allegations of kickbacks to Korean government officials dogged the project, and by early 2000, prosecutors were following up on allegations of millions of dollars of illegal money transfers to Alstom lobbyists. Though it was a logistical and engineering gamble, officials say the KTX has brought Korean transportation infrastructure firmly into the 21st century. After the long dark tunnel, cluttered with political and diplomatic baggage, the KTX is finally out and ready to launch the Korean way of life into a time warp.